Camera charges/Jeep Camel/Elephant Ride charges. Surprise is the keyword for the deserts of Rajasthan as they are mostly encompassed with a rocky and thorny terrain, punctuated by sand dunes, the winds forming perfectly contoured ripples on that spiralling surface, though when seen at sunset they become bronze and gold paintings. Home to the camel, the desert fox, the Great Bustard, a distinctive culture of camel fairs, music of the nomadic communities singing and dancing in cheerful abandon and the famous fort palaces……….does it sound like a fairytale or a dream come true, whether this escapade is a honeymoon romance, or a wedding anniversary romance, or just pure simple romancing Rajasthan! This `gem of the desert’ or as it is also called the `ship of the desert’ has its folklore resounding glorious legends and its splendour, because as everyone swings to the traditional beats, they become part of more than just a celebration! So, get on board the flight for this ecsatic trip! After the representative checks the tourists into a hotel, the trip starts to the walled city of Jaipur, which has lived up to its reputation of a beautiful, planned city with its enchanting bazaars bearing their heritage with esteem as the uniform pink hue adds romance. Thence, the capital city of Rajasthan seeks to combine the modern with the ancient, the software tsars with kings, and gleaming malls with resplendent palaces! Travellers may explore the old city starting from Chowkri Sarhad covering two palace blocks with temples, gardens and other buildings. The City Palace is a medley of Mughal and Rajput styles surrounded by courtyards, gateways, gardens and temples, made of marble and sandstone. The Maharaja Sawai Man Singh II Museum lies within displaying costumes, weapons miniature paintings, manuscripts and memorabilia. The Diwan-i-Khas and Diwan-i-Am have marble pillars and arches, painted walls and ceilings, cut-glass chandeliers and assorted curios, with the courtyards decorated in brilliant colours. The old bazaars are located within the walled city and nearby lies the Hawa Mahal, known as the Palace of Winds, with its ornate sandstone windows, curvilinear roofs, domes and finials add to the look. The Havelis that still line the city with their arched entrances, carved balconies, coloured glass windows and painted inner chambers stand as testimony to the architectural splendour! 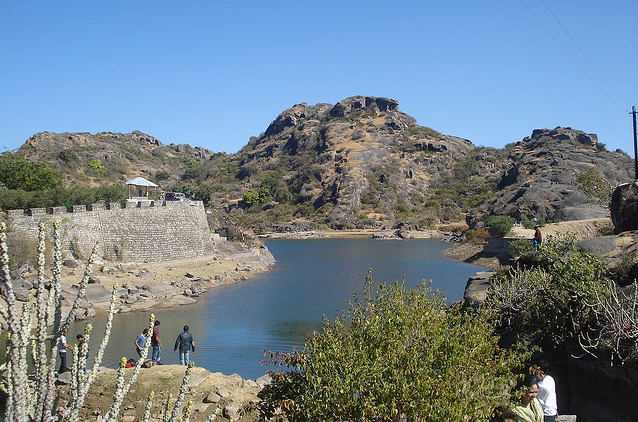 The Fort of Amer (Amber) appears stunning, straddling the hillside, reflected on the surface of the small Maota Lake. The Jantar Mantar Observatory has an extraordinary collection of the best astronomical instruments. After these enigmatic important sites, drive down in the evening for dinner to the ethnic and rustic flavour of Chowki Dhani, and then return to the hotel to sleep for the night! Faith and history associate with Ajmer! After an early breakfast in Jaipur, start for the Dargah Sharif, the final resting place of the Sufi saint Khwaja Moinuddin Chishti, which is crowded with devotees from all over the world…..where the air is thick with the scent of roses and incense and the fervour of prayer, but is also a complex full of many structures such as the marble tomb chamber having a soothing arena with silver doors and a golden finial. The vast courtyards on both its sides are often full of qawwali gatherings, singing Sufism which became synonymous with Islamic mysticism, with a passionate focus on the devotee’s adoration of God! Return back to Jaipur for an overnight stay in the hotel! After breakfast, start for this mystique region called Shekhawati showing ideas that engaged the imagination of its denizens painted on the walls……. as angels going up in hot balloons, Gods wearing wrist watches and shoes……proclaiming `what if god was one of us’………..although in town after town, the havelis are rich with murals, princes and gods, steam engines and cars, painted to emphasize their wealthy status. Explore Mandawa, and spend some tranquil moments atop one of the bastions of Castle Mandawa as the view from this point,particulary during sunrise and sunset is most therapeutic! Horse rides, safaris and camel safaris are optional and available on request, to serve the adventurous romantics! Overnight stay at the hotel or resort in Shekhawati! After breakfast, leave for the Ranthambore National Park, a land that is pure magic as it is full of romance of the wilds and the intrigues of history-ruins smothered by roots, herons on lakes, a million myths about Raja Hamir and the glory days of the `impregnable’ fort. Most tourists would like to visit a Ganesh temple here as much as they would walk through the tiger forests! Move on to the jungle jeep safari in the evening for tiger spotting and its other endangered accomplices, witnessing ensnaring animal and bird movement. Move on for a quick visit to the Jogi Mahal and the Ranthambore School of Art. Spend the night at the hotel in rooms or in tents! There is something primal about being around this Park as ancient ruins, nature and contemporary village life make layers of history almost tangible and hence it becomes necessary to visit the Ranthambore Fort and wake up early to witness its beauty at sunrise! After breakfast, leave for Udaipur, hugging the Pichola Lake, astoundingly picturesque as the town boasts of lakes, lake palaces, mansions and gardens. The main area of interest is around the City Palace with a maze of lanes, bazaars and temples, with the ever-present option of escaping to the banks of PIchola to take a boat ride or cruise, or view the palaces and hills embracing its contours, havelis, houses and hotels finding their subsistence in waters. The City Palace also encloses a Museum, besides showcasing a world of luxury and indulgence in its interiors. A tantalising `Sound and Light Show’ is held at the Manek Chowk every day! The Crystal Gallery in Fateh Prakash Palace is really an extravagant and profligate display of wealth lined with an assortment of crystal chairs, beds, sofas, glasses, dinner sets, flywhisks, crystal decanters, juicers, wine glasses,even lawn sprinklers, and a bejewelled carpet! Overnight stay at the hotel! After breakfast, move towards the exquisite Jain temples of Ranakpur which are a touch of glowing white marble in the green hilly part of Rajasthan as the temple complex stands radiant in a forest on the banks of the rivulet Maghai. The temples are gloriously sculptured and enchantingly situated with rich, intricate ornamentation, delicacy of carvings and pierced stonework, namely, the Chaturmukha Adinath Temple, the Parsvnath and Neminath Temples and the Sun Temple! Return back to the hotel for the night overwhelmed by these intoxicating sites! After breakfast, start for Jaisalmer, another exotic destination for the romantics, standing in its pride with the yellow-sandstone fort, the town’s signature sight, embedding a world of turbaned heads, moustachioed faces and long ghagras. The desert is in fact a cinematic image of uninterrupted sand dunes, where the tourists may camp, sit by bonfires and enjoy the ethnic music and dance! The Jaisalmer Fort supported by yellow stone towers, often becoming golden, and stone-paved passages through massive, intricately positioned gates, may leave the romance spellbound in its warmth and intimacy! The Raj Mahal Palace, is open to the public in parts, as the Jaisalmer Palace Museum and Heritage Centre which lends spectacular views from the rooftop. In the early evening opt for a great camel safari by jeep to the Sam Sand Dunes, hop on to the camel for an hour, watch the frolicking chinkaras, and relish the beauty of the sunset in this desert land! Return back to the hotel with the aura of these mesmerising sights and have a peaceful sleep! After an early breakfast, tourists may quickly breeze through the Parsvanath Temple, in Jaisalmer,the entrance of which is through a carved torana with an image of the deity at its summit, the Patwon-ki-Haveli complex, adorned with jails and elaborate facades with skilful stonework done on the outside, Salim Singh-ki-Haveli which has its storeys replete with delicate carvings and garnished with charming balconies as the pavilion seems to float on the top of the building, and finally Gadisar Lake, a charming picnic spot, with a domed pavilion in the centre of the water,and more pavilions and shrines in the same style lining the pond. The Indira Gandhi Canal supplies water to the tank and it is never dry! Return back to the hotel to catch a flight to your place of residence! The Romantics leave the desert land with their hearts content and charmed by the majestic heritage and warm and intoxicating interiors on this short journey, wanting them to come back to rekindle their romance again and again, as there is still enough to discover in this vast land! For shopping, Rajasthan has plenty of outlets and vendors all around, prominently displaying particularly attractive and colourful textiles with mirror work, to be used as bedspreads, hangings or duvet covers. Carved stone pieces, turbans and ravanhattas (musical instruments) make for interesting souvenirs. Camel leather goods liked bags, jootis, sandals are popular purchases. Handicrafts such as embroidered fabrics, tie-and-dye material, wooden decorations and a variety of stone, semi-precious and gem-studded items. There are plenty of painters and scores of shops selling miniatures done on paper, cloth, stone and wood. Silver jewellery, handmade paper, papier mache and block printed clothes are on offer! There is an abundance of meenakari jewellery in silver, gold and diamonds and polki, thewa carvings and naqashi ornates on the precious metals, and the land is famous for pearls, precious and semi-precious gems. Rajasthani quilts and linen are always in demand and the outlets have an extraordinary collection in cotton, silk and velvet! Bundi murals on silk or paper, or miniatures, are also bought as ideal gifts or collections! Lined up throughout the desert land to entice the palate of Indian and International tourists!